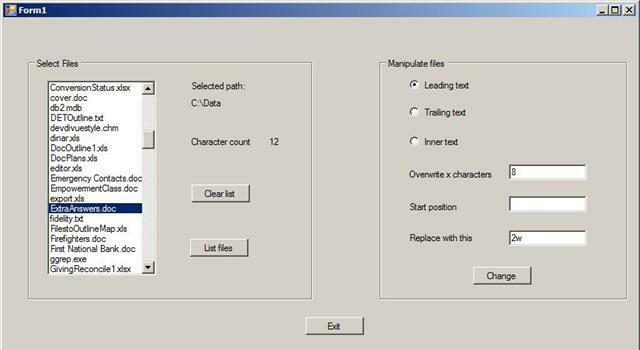 This sample application shows how to use x to create an application that renames files in bulk. Drag a 2nd GroupBox onto the form, and then drag 3 radio buttons, 3 labels, 3 text boxes and one button onto the groupbox. Arrange the controls to look like the diagram. Add an Exit button at the bottom of the form, as seen in the following illustration. Add a using statement for system.io. Add a struc at the top of the Form1 class. Add code to the Form1 constructor to initialize the folderBrowserDialog control. Be sure you point to the correct label to display the path. Add simple event handlers for 3 of the buttons: clear list, list files, exit.